If you want or need to add more bullion, right now offers the best opportunity in 10 years to do so on the cheap. Both metals prices and purchase premiums are on the deep discount rack. When gold and silver prices temporarily fell in the initial stages of the Great Recession, investors thought they could snag some great deals. But premiums spiked due to a surge in demand, making the final cost to the retail buyer not much lower at all despite significantly lower spot prices. And when precious metals prices rise sharply, competition for business tends to heat up, also due to the increase in demand, forcing dealers to lower premiums. But the total cost is still higher because metals prices have risen. 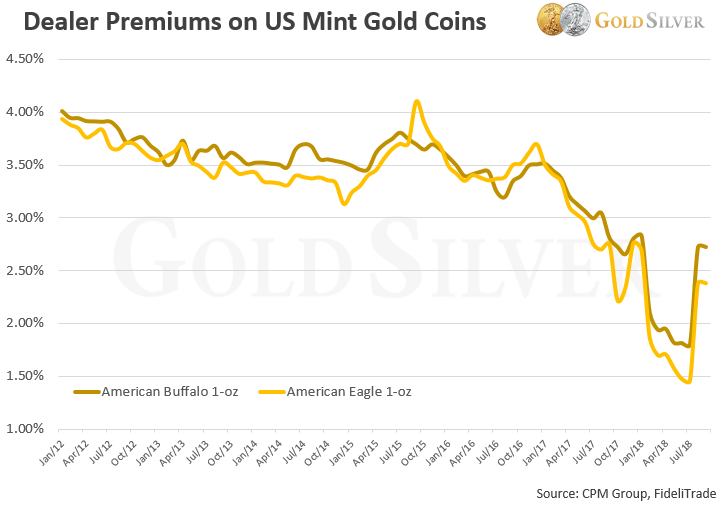 CPM Group tracks premiums paid by dealers to the US Mint, and here’s their updated data. Notice the persistent downtrend over the past 7+ years in wholesale premiums. Wholesale prices on Gold Eagles are currently 30% lower than what they were in 2012. In fact, there have only been a few times since the Gold Eagle coin was first produced in 1986 when you could buy them at a discount this steep. The situation with silver is even more dramatic. Even though silver premiums are higher than gold’s, check out how wholesale premiums today compare to what they were during the depths of the market crash in 2008. Wholesale premiums on popular silver products are a full two-thirds less now than they were when metals prices were lower. 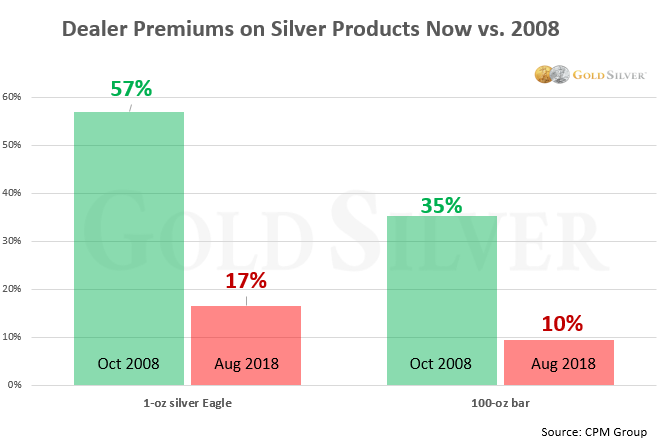 And don’t forget these are dealer premiums; the retail premium is higher, easily another 20% industry-wide for a Silver Eagle in October 2008, for a total markup of about 77%. Believe it or not, a one-ounce Silver Eagle is cheaper now than then because of the significantly lower premiums today. 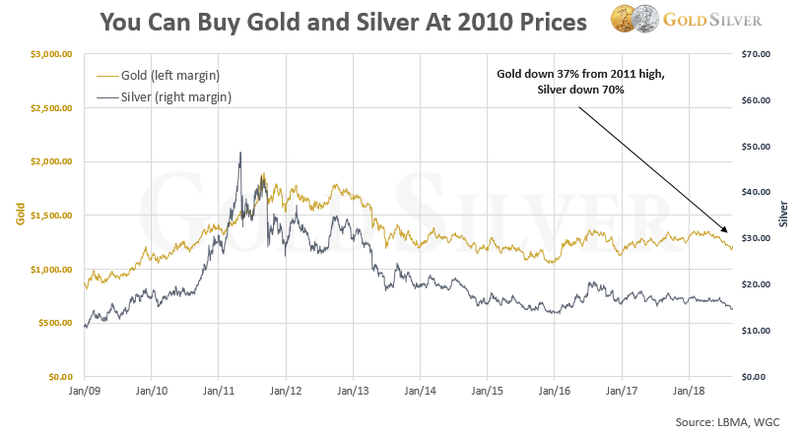 Silver’s average price in October 2008 was $10.44, but after adding the 77% premium your cost was $18.48. As I type (August 25), you can currently buy a monster box of one-ounce silver Eagles for $17.45 per ounce, despite a spot price that is 40% higher. In other words, lower metals prices without the spike in premiums. That’s not just a deal, it’s a steal. While it’s no fun to watch gold and silver prices continue to be weak, it’s hard to ignore just how far they are from their peak in the last bull market. Gold is now over a third cheaper and silver over two-thirds cheaper than their peak during the last bull market. And as Mike Maloney has demonstrated, what’s ahead for our economy, currency, and markets will push gold and silver into hyper-bubbles. It is truly a buyer’s paradise. Remember, gold is not a trade. We’re accumulating for a major crisis and wealth transfer. Total US government debt has more than tripled since 2007, the budget deficit is predicted to reach $1 trillion by 2020, and bond sales have risen to match what we last saw during the depths of the financial crisis in 2009, all of which increase the likelihood of some serious fallout that gold can help shield us from. We can all continue to prepare for what lies ahead by taking advantage of the buying opportunity staring us in the face. It won’t last forever. With GoldSilver’s scale and price match guarantee, I encourage you to follow Mike and I and snag the deep value currently available. Someday soon it won’t be.